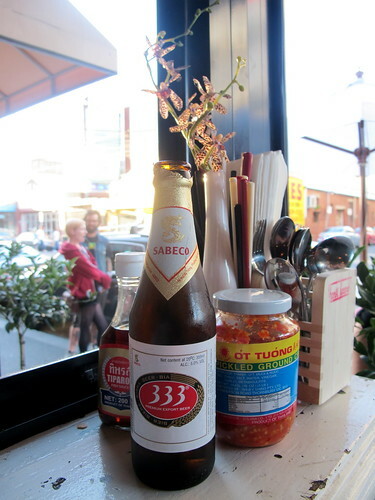 Located in Prahran/Windsor on High Street just off Chapel Street, new casual Vietnamese restaurant Hanoi Hannah cheerfully plugs a gap in Melbourne's dining scene by giving south side residents in need of a phở fix a cheap and bustling option on their side of the river. 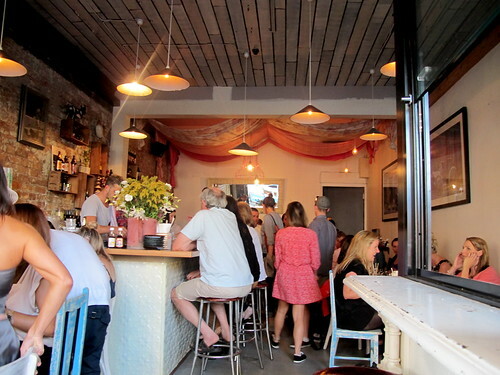 It opened a fortnight ago, and when I tried to pop in for lunch with Jackie a few days after opening, one of the owners had to ruefully tell me that they were unexpectedly closed for lunch that day because they'd run out of food (!). I made plans with Tom to try again and we went for dinner on Wednesday night: it was already buzzing with young trendies. Tom ordered a fresh coconut juice ($5) which came served in a branded coconut, in the manner of some of the cocktails the bartender was making. I was happy to see Halida beer from Hanoi on the menu (which I haven't had since I was in Hanoi six years ago), but our friendly waitress explained that their Halida supply was still in a boat on its way to Australia. I settled for a bottle of Ba Ba Ba Premium ($7) instead. 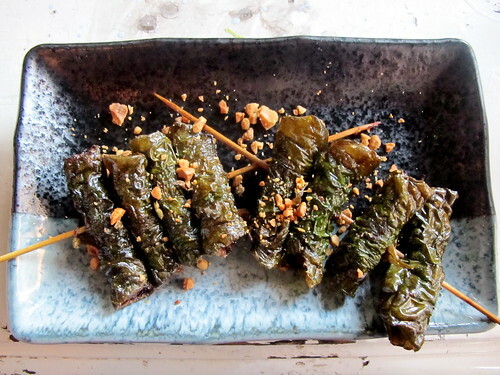 The bò lá lốt cigars ($8), served on skewers, were excellent: the vine leaves were crispy but the beef was succulent. 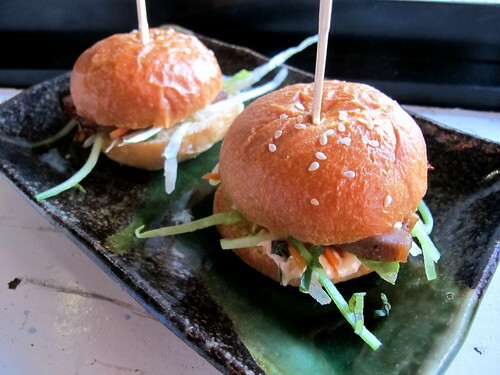 Seeing "pork belly sliders" on the menu nearly made me drop my monocle in surprise. Yes, very On-Trend Dude Food Melbourne ca 2012 (wouldn't they be more at home on the menu at The Smith across the road? ), but not very Viet Nam, I'd've thought. But my curiosity was piqued, so I ordered them for us ($8 for two). And yes, they were very good - obligatory brioche bun, Sriracha Kewpie mayo and all. 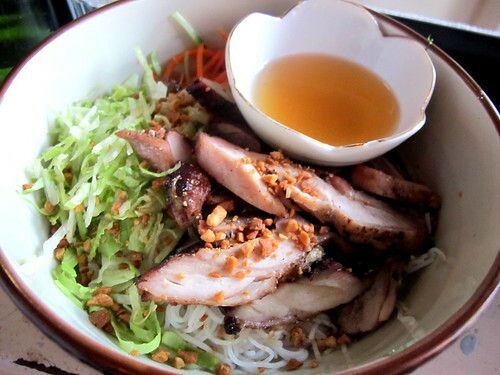 Tom reported back favourably on the vermicelli salad with grilled chicken ($10). 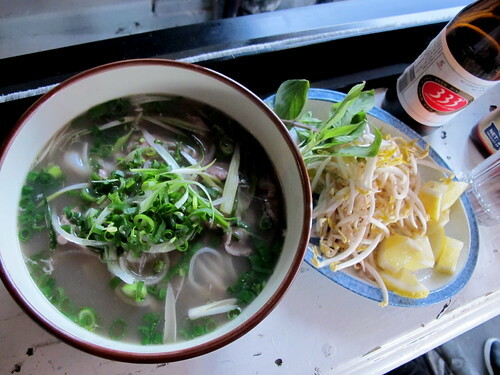 I had a bowl of the beef phở ($9). While it wasn't the best phở I've had in Melbourne (that would probably be a tie between Hùng Vương and Phở Tam, both in Footscray), it was a damn sight better than some of the phở I've had on Victoria Street. Good price, good noodles, good beef, reasonably rich broth - though a few different garnish herbs to play with would've been great. It's easy to see why Hanoi Hannah is packed already. 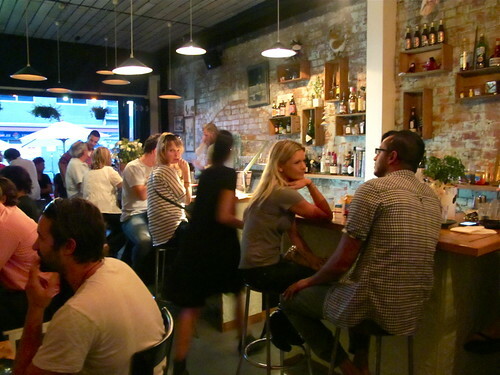 The booze list is short but savvy, with an eye for what the kids are drinking in Melbourne at the moment. Most dishes hover around the $8-$10 mark: a glass noodle salad with shredded duck is the most expensive option at $13. Bánh mì are available at lunchtime and as noted at the top of this post, they'll soon be open for breakfast. I'll be back! If you can't get in, I've heard good things about bistro Franco Choo's across the road, plus cheapish Thai food (that I loved) at Colonel Tan's is only a short walk away. The [aforementioned] Smith if you're prepared to splash some cash. Pssst, Hanoi Hannah: upload a higher res version of the image on your website, so that we can read all the writing! Sounds interesting. Can't wait for them to open for brekky. Need a few more interesting options! I'm heading there for dinner tonight. I hope the Halida has arrived! there's nothing I enjoy more than a drink served inside hollowed out fruit! Be it melon, pineapple, coconut... or anything else you can think of, really. 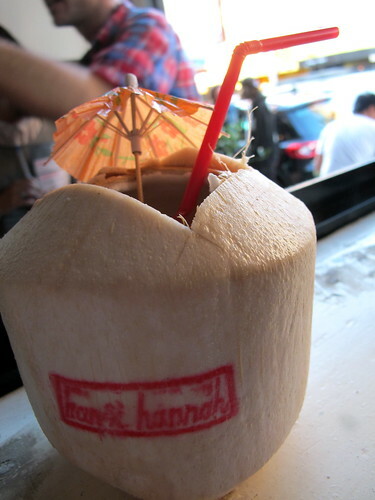 The branded coconuts is such a cool idea.